The value of pipe #275 is n/a points. At the Richmond, VA pipe show, Bob Grosz pulled this beauty out from under the table where he was keeping it for me. He asked me whether is was Burnt Orange or Coral. I couldn't tell for sure myself without having pipes of known coloring to compare it to, so I offered him two prices - one for the Burnt Orange and another if it turned out to be Coral. 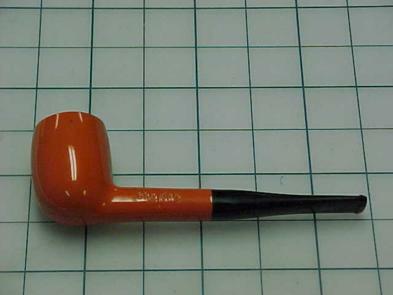 Bob graciously let me take the pipe and send him a check after I compared and determined the color. It turned out to be the orange and, since I have a Burnt Orange Billiard examplar which is unsmoked, this one goes to the Pipes for Sale page to find a new home. It didn't take long for Kurt Sanford to find this beauty and grab it up.